This information is taken from the FDA website which outlines drug shortages and the reason why there is a shortage. If you want to view the entire list of drugs which are experiencing a shortage, check it out here. I have only listed the reason why amphetamine salts (the generic compound to make adderall xr and generic adderall) is on the short list. 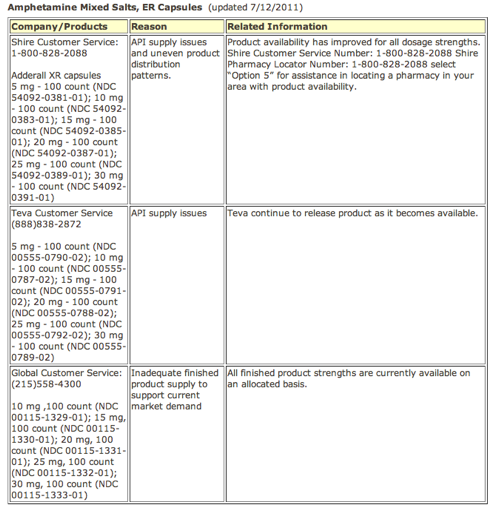 The cool thing that Shire does, is allow you to call their customer service number and pharmacy locator to find out where adderall is in stock. Not a bad idea, considering I’ve called 7 different pharmacies before finding a place that had some adderall in stock. Use the information below for as an adderall pharmacy locator. Shire & Teva should help you. Good luck and Godspeed on finding your prescription.